We believe in the personal touch and do not have a shopping basket type shop. We are a real experienced manufacturer, If you are a a University, NHS Trust or Blue Chip Company you should not be expected to pay for a product before you see it, we are happy to supply you based on a Purchase Order. If you have any questions please call, you will find knowledgeable assistance and guidance if you need it. We supply many Universities such as the University of YORK –University of SOUTHAMPTON – University of EAST LONDON – University of READING – LOUGHBOROUGH COLLEGE We produce Printed Conference Tablecloths for the NHS to Trusts all over the Country. We also produce for worthy Charities including Canine Partners – Dame Vera Lynn’s Children’s Charity, RSPCA, Help for Heroes – MAYHEW Animal Charity and many more. Each of these Charities needs their own required Corporate Pantone Shade which they are delighted to find we can match from our vast stocks of Pantone Colours. This enables them to have as few as one off! We offer special discounts to charities. We bought a fabulous table cloth from yourselves around 4 years ago that has unfortunately gone missing. I wanted to know if we could reorder the same table cloth colour,size.logo etc? I am happy to put something on your website if there is a page for references?? 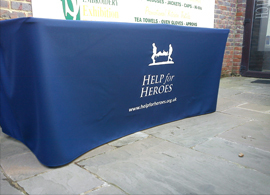 Your own Printed Exhibition Table Cloth personalized with your logo made from UK Woven Polyester Twill 215gsm. Exhibition Tablecloths are available with over 40 pre-dyed colours to choose from matching or coming extremely close to many PMS shades. We provide, at a small premium, Printed Table Cloths made from Heavyweight Cotton Polyester Twill at 245gsm for the Traditional Linen feel and look, although this fabric has a more limited colour range.